Waltja Tjutangku Palyapayi Aboriginal Corporation (Waltja) is an Aboriginal controlled community-based organisation, which does good work with families, grounded in strong culture and relationships. We work in remote Central Australian Aboriginal communities, across nine languages and across more than one quarter of the Northern Territory, delivering community driven programs to strengthen culture and language, strengthen families, and to invest in future generations. Waltja has an arts social enterprise, offering a range of authentic, original and practical artworks – from diary or journal covers to clapsticks and jewellery, hand-made in Central Australia. Waltja also is developing another social enterprise which offers cultural programs for government, business and tourism sectors. Waltja is governed by a Board of Directors who are senior traditional Aboriginal women, permanent residents and leaders in the remote communities where we work. Directors represent the community they live in, and they are the link or bridge between the Waltja office and community, Waltja workers and community and with other communities where Waltja works. 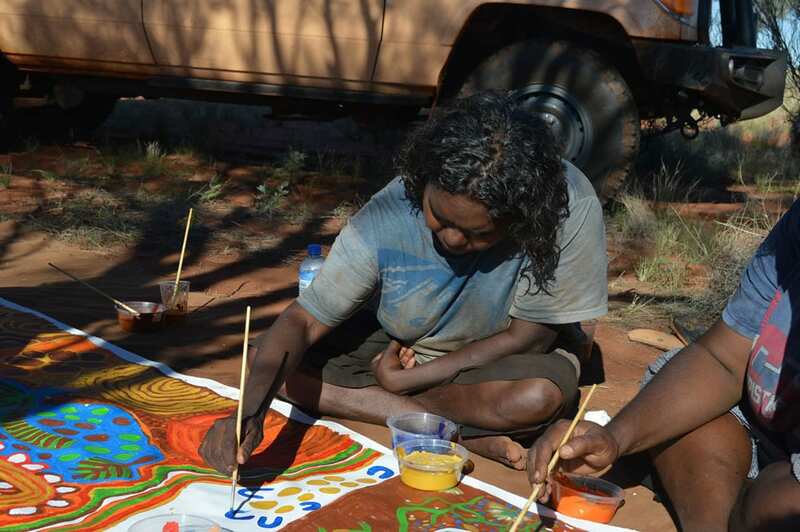 This means that Waltja is based in remote communities and in Alice Springs. Waltja’s foundation is the leadership of strong Aboriginal women, our focus on families, and our active support for community self-management and self-determination. In 2014, Waltja was awarded the Reconciliation Australia Indigenous Governance Award for the best governed Indigenous organisation in Australia. “Our logo shows strong women working together, talking about what programs we need in communities and how Waltja can work with other organisations to run these programs (with funding or other support)” Punata Stockman, Mount Liebig – designer of Waltja’s logo. * Help us to promote and share our story – Follow our FaceBook Page and Twitter Feed, and encourage your friends, colleagues and family to follow us too, and help us to spread the word about the work we do with families in remote inland Australia, and share our stories and videos from remote communities. * Visit our online art store, for handmade, original, authentic art, many of which are practical too. We welcome bulk orders as well as individual orders, for example for corporate gifts, conference speaker gifts, competition prizes, awards etc. Income from sales goes directly to support Waltja’s work in strengthening culture and language and strengthening families. Encourage the organisations and businesses you are connected with to consider purchasing art products from us. * Support our work by making a donation, or funding a specific project or program. * Be part of our extended Waltja (family) across the world.